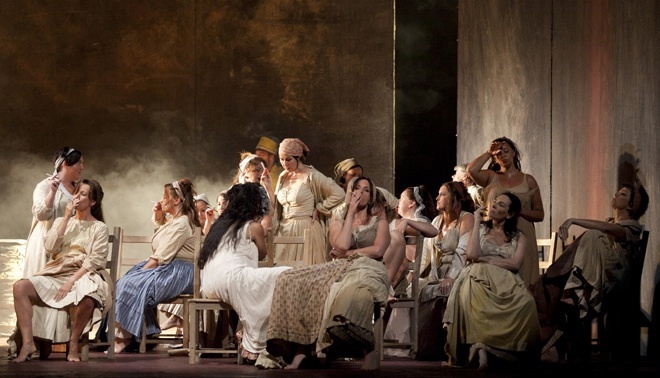 As one of the most passionate operas you can see, Carmen is all about seduction, lust and being a free spirit, and that mood was impressively recreated even though leading lady was seven-months pregnant in real life. 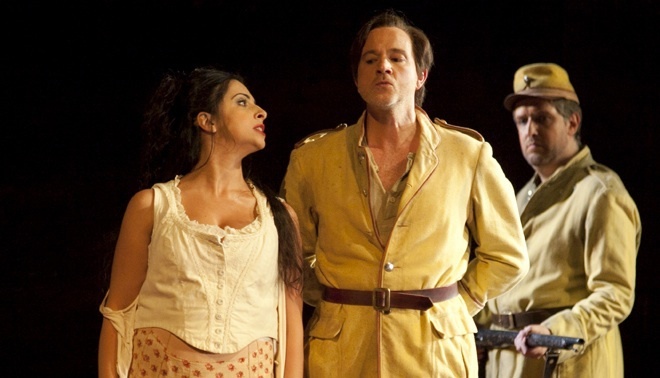 Alessandra's intensely powerful and tantalising voice left no doubt to why our poor hero Don Jose is beguiled and seduced by gypsy Carmen into giving up his moral duties as a soldier to run away with her and a gang of smugglers. With some carefully placed costume fittings and chairs, it wasn't always obvious that the singer was just a few months away from giving birth and it in no way affected her acting, singing or the action of the show in any way. 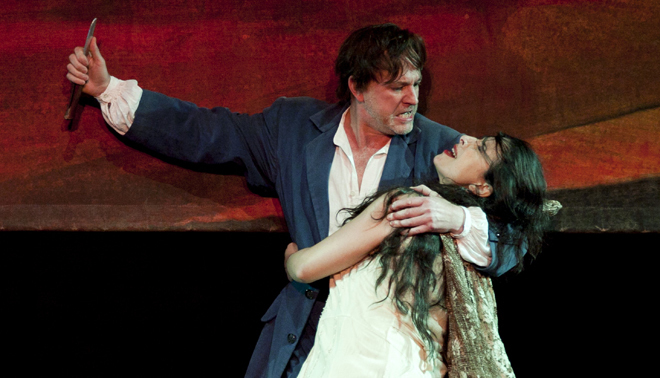 The Welsh National Opera (WNO) brought Carmen to Birmingham Hippodrome as part of its latest Liberty or Death! season that continues in the city until Saturday November 22. 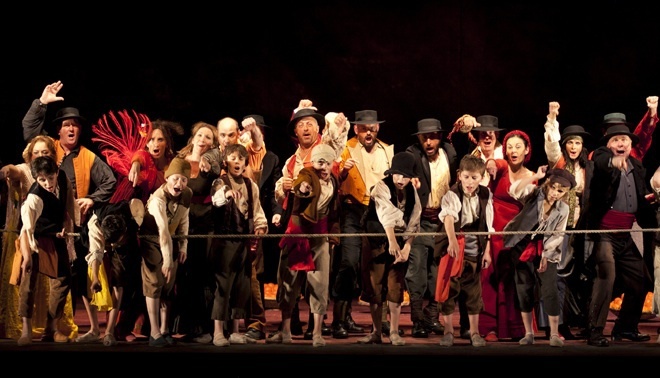 The other operas being performed are Moses In Egypt and William Tell. Sung (and spoken at many points) in French with surtitles in English, the drama unfolds accompanied by majestic arias and well known choruses, including Habanera, Toreador Song and the deux cuartos. These harmonious creations by composer Bizet are, in part, so familiar due to being used in multitudes of adverts and television shows for decades. 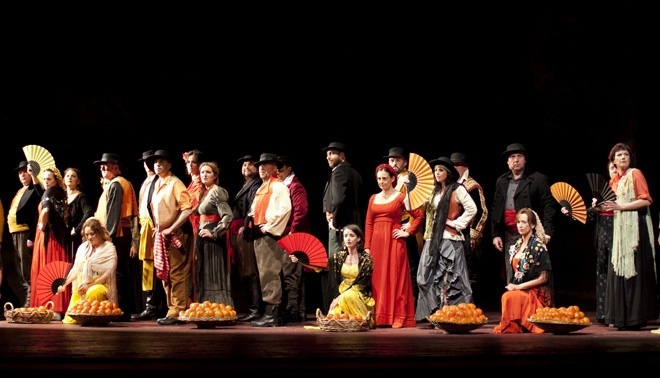 What's more, this makes Carmen probably the best opera to see as a beginner to the musical genre as it is easy to understand, has these wonderful recognisable tunes and a dramatic enticing tragic storyline. Set in Spain, we see an honourable soldier's head turned by sultry gypsy woman Carmen, who is a troublesome worker in the cigarette factory. When she persuades him to let her go after she is arrested for starting a fight, it leads to the soldier being demoted and sent to prison, setting him off on a fated path that leads to passion but also jealousy, anger and death. This traditional production had some fine touches amid a relatively bare stage that used bold abstract painting backdrops and moments of distinctive choreography instead of big sets. The sunshine Spanish bullfighting city of Seville was recreated by baskets overflowing with Seville oranges, while the crowd cheer on the bullfighters in slow motion as the chorus music roars to a crescendo - it's an effective eye-catching and well thought out scene by the directors Patrice Caurier and Moshe Leiser. Added to that were the soothing voices of Peter Wedd as Don Jose and Jessica Muirhead as the good girl Micaela, who secretly loves him from a far. Gliding through a fabulous soundtrack of opera arias with style, this production was a fine performance of Carmen that offered passion and plenty of sass. For tickets, visit the Welsh National Opera website or the Birmingham Hippodrome website. Running time - 3 hours including one interval.